I took delivery of my Velokraft tailbox today (after only 4 months wait! ), and a very nice piece of kit it is too. It’s about the same weight as the mudguard that needed to be removed to fit it! The nice people at Bikefix fitted it for me. 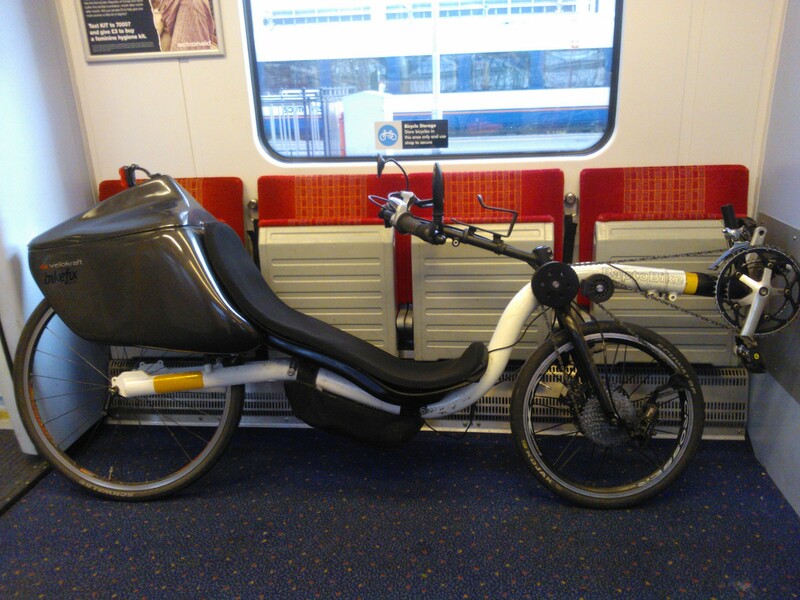 Here’s a picture of the assembled beauty, taking advantage of South West Trains’ bike space. Glad I didn’t try this at rush-hour! There was much appreciation of the box outside the shop from various recumbenteers, including a velomobile rider. Also, someone wandering about on his lunch break took the time to say, “that’s awesome” as I waited at lights. No, I ordered it through Bikefix (http://bikefix.co.uk/). I’m not sure how I got onto them as importers. I’m glad I did, because the Velokraft people seemed rather disorganized and initially built the box for the wrong type of seat.